The fiancée of Jamal Khashoggi, a journalist and prominent Saudi critic who died inside the Saudi consulate in Istanbul, wrote a touching tribute to him on Twitter. “They took your bodily presence from my world. But your beautiful laugh will remain in my soul forever,” Hatice Cengiz tweeted Saturday evening, along with a video showing Khashoggi laughing during a TV interview. Cengiz, who is a Turkish national, last saw her fiancé after he entered into the consulate on October 2 to retrieve documents for their upcoming wedding. She says he never exited the building. She has been put under 24-hour police protection, Turkish state media said, hours after Saudi Arabia admitted that Khashoggi had died inside its embassy. “They took your bodily presence from my world. But your beautiful laugh will remain in my soul forever. My darling #jkhashoggi,” Hatice Cengiz tweeted Saturday evening. 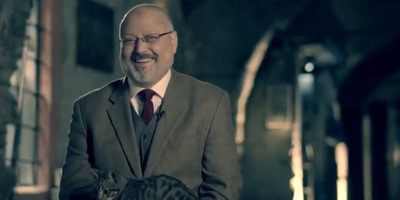 Cengiz attached a video of Khashoggi during an interview for a TV documentary. During filming, a cat jumped onto Khashoggi’s lap, causing the journalist to erupt into laughter. “You should leave this in the film,” he tells the camera. Cengiz, who is a Turkish national, last saw her fiancé after he entered into the consulate on October 2 to retrieve documents for their upcoming wedding. Cengiz says she waited for Khashoggi outside the consulate for roughly 11 hours but he never came out. She was told to call Turan Kislakci, the head of the Turkish Arab Media Association, in the event he did not exit the embassy, CNN reported. Cengiz has been active on Twitter and has repeatedly called on world leaders to wrap up their investigations and disclose details on Khashoggi’s whereabouts. Cengiz has been put under 24-hour police protection, according to Turkish state news agency Anadolu. The order was made by Istanbul’s governor’s office, but didn’t specify what prompted the decision to increase her security detail. Saudi Arabia acknowledged on Saturday that Khashoggi had died inside their Turkish consulate, but claimed that the 59-year-old was killed in a “fistfight” that escalated. Saudi Foreign Minister Adel Al-Jubeir on Sunday denied that the nation’s powerful Crown Prince Mohammed bin Salman was behind the journalist’s death, and reiterated claims that a “rogue operation” was responsible. But officials are sceptical of Saudi’s explanation for the Khashoggi’s death. Turkish officials have repeatedly touted claims that Khashoggi was brutally tortured and dismembered by what appeared to be a 15-person kill squad flown in from Saudi Arabia. “Obviously there’s been deception, and there’s been lies,” he told said during an interview with the Washington Post on Saturday. US officials have repeatedly called for Trump to order an investigation and trigger possible Magnitsky sanctions against those involved in Khashoggi’s disappearance. For now, the US, Saudi Arabia, and Turkey are continuing their investigation into the incident before Trump or the US Senate decide to retaliate.